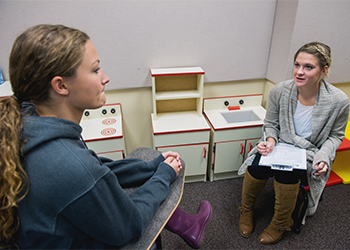 Our Speech and Hearing Clinic is training ground for Marquette University's speech pathology and audiology program. All evaluations and therapy are closely supervised by clinical faculty who are certified by the American Speech-Language and Hearing Association and licensed by the State of Wisconsin. Referrals are accepted from any source. Diagnostic and therapy summary reports are provided upon written request. From six months through adolescence, adults, and geriatrics. The Speech and Hearing Clinic operates on a semester basis, including summer. If no immediate openings are available, every effort will be made to enroll you or your child in the next semester. Clinic hours are Monday through Friday, 9 a.m. to 5 p.m. Some adjustments to this schedule may be made during the summer semester. Marquette University students and their dependents are exempt from diagnostic evaluation and therapy fees. The MU Speech and Hearing Clinic accepts payment for services in the form of cash, check, or money order. No one will be denied services because of an inability to pay the standard fees. Payment adjustments can be arranged.